The Reporters’ Academy and Sandymoor School embarked on a new initiative. A completely fresh look at student-led media production, so that young people could see themselves in a creative environment, work as a team and explore talents not always celebrated in a traditional school environment. TRA developed the skills of a ‘Sandymoor Crew’ to the point where they planned, filmed and edited a report on the activities of the local Rugby League team, the Widnes Vikings. The Crew were tasked with providing a video report on an aspect of the club. They had to brainstorm a number of possible scenarios, storyboard them and then pitch the final proposal to representatives of the Vikings and Sandymoor School. Once the final project was agreed on, work commenced. The final piece was premiered in school, during a whole school assembly, and then was shown to the Vikings Chairman & dignitaries in the Chairman’s boardroom before a Super League home match. The TRA Sandymoor Crew are now going to develop over time into a team of students entirely responsible for recording all school-based events, in the most appropriate media. This could be anything from a more traditional school newspaper through to a school-based internet TV channel. There is a long term commitment to the partnership with a Level 3 BTEC Sports Media qualification delivered by TRA in partnership with the school. The content was placed on Youtube, Widnes Vikings, Superleague and Rugby League World Cup websites and showcased live across a number of venues linked to the rugby and education. 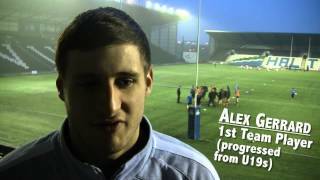 With a little help from The Reporters' Academy, Students from Sandymoor secondary school have produced this film looking at the evolution of the Widnes Vikings. After a 10 week training programme with The Reporters Academy, 10 students from the unique new free school, Sandymoor put their training into practice to produce this fantastic film on their local rugby league club.